Holiday entertaining tips and traditions were the topics of a lovely conversation I had last week with Lucinda Scala Quinn, Executive Director of Food & Entertaining at Martha Stewart Living Omnimedia, cookbook author and host of Hallmark Channel’s Mad Hungry with Lucinda Scala Quinn. 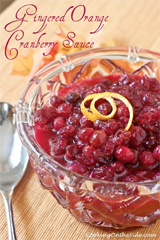 Whether you’re attending a holiday party this week and need ideas for the perfect hostess gift or you’re looking for a homey comfort dish to serve on Christmas morning our interview will give you some great options. A spokesperson for Bauducco Panettone, Lucinda also shared some tasty ways to enjoy the sweet, Italian specialty cake during the holidays. 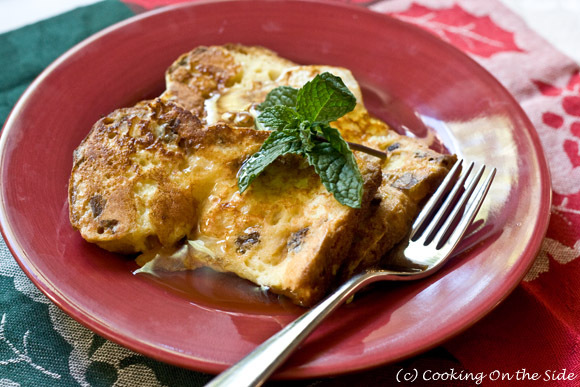 You’ll find a great recipe for Panettone French Toast at the end of this post. 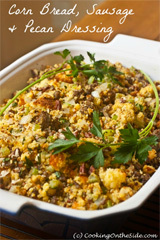 Cooking On the Side: What are you and your family planning to do for the holidays this year? Lucinda Scala Quinn: Normally, we stay in New York. We love New York, it’s very festive. We have our traditions for Christmas Eve: we do the Italian side of the food chain on Friday night and then we do the English side on Saturday. So I make a big Italian feast for Christmas Eve and then for Christmas Day we have a six-rib standing rib roast. It’s kind of a present in and of itself. Only once a year would I buy something like that. It’s actually quite easy to cook if you handle it properly. And then it gives off all those drippings and I make individual Yorkshire puddings. I can’t even make enough of them anymore. It’s one of those things about building traditions – if I tried to stop doing that I would have a riot on my hands. I didn’t grow up with that but I just started doing it myself and then my family just loved it. COTS: I wanted to ask you about when you attend gatherings. What do you typically like to bring as a hostess gift when you’re invited to somebody’s house around the holidays? LSQ: I always think about bringing something that’s not going to complicate the hostess’ life. Around this time of year I do the simplest, simplest thing. I buy vodka and a bunch of Meyer lemons and I just peel off the peel and try to do it in a nice circular sort of spiral. Then I just put the lemon peel in the vodka, buy a nice-shaped bottle, take off the commercial label, clean up the bottle and put on a bow. So you’ve got the clear [bottle] with the beautiful lemon peel. Even if it only sits one day and they want to use it it’s great. If it’s two months [later] it’s great. It looks like it’s a gift, it isn’t just meant to be used that night. COTS: Plus, it’s got that personal touch without a whole lot of effort on your part. When the Executive Food Director for Martha Stewart Living shows up at their house I imagine some people are a little on edge about how their party goes. COTS: It’s simple, but it’s still lovely and, like you said, it’s not something that someone has to serve that night. It can still be a gift. Switching gears a little, I wanted to ask you about the type of party you like to host around the holidays. LSQ: Don’t laugh, but one of my favorite things to do are cheese balls. I start with a base mixture that basically has cream cheese, butter and seasoning. Then I divide it into two or three balls and I personalize each ball. One might have chutney and cheddar. One might have Roquefort and cognac and a little shallot. And I might mix one with goat cheese and scallion. And then I’ll roll then in different things. This year, I put the goat cheese one in chopped parsley, and then I rolled the chutney one in chopped cranberries so then you have green and red. I have this big platter of cheese balls and all kinds of things to eat them with. I like to go heavy on hors d’oeuvres so if you didn’t eat dinner you felt like you’d eaten something. Either that or it’s sit-down [dinner] with maybe six people. I don’t love big sit-down dinners at the holidays. There’s just too much going on. I like [food that’s] heavy enough for dinner but served in appetizer portions. I might get four Frenched racks of lamb, roast them off and make a big sauce. Then you’ll have a little baby lamb chop that you can pick up with its own utensil. That’s a little special, but it’s not like sitting down and having a plated lamb dinner. Then I always have a punch, a cocktail and a bunch of sparkling water. I don’t go in for a full bar. I make a bunch of the punch in advance. I have the guests make the cocktail themselves. I did apple-tinis and a blood orange punch this year. I have a recipe, two cocktail shakers and all the ingredients out. It’s fun because you meet people around the bar when you’re making your own. It also keeps people from getting too hammered because they have to make it themselves. It’s fun. And then I’ll have wine, but I don’t even worry if I don’t have beer. I’m big on having fewer things rather than too many options that overwhelm me and requires really thinking about how they mix and match with each other on the palate and on the plate. COTS: That last point you mentioned, I think a lot of people don’t really think about that. You tend to think about all the things you love to eat but then you sort of forget that maybe it all doesn’t taste so great together. You know, the crab cakes next to the chocolate truffles. LSQ: That’s how I plan any menu. I picture the plate first, like it’s sitting in front of me. How are the flavors going to work together? How are they going to look together? That’s how I also figure out quantities. I just take that one plate and multiply it. COTS: That’s an excellent tip! All right, let’s talk about panettone. I hadn’t tried one before I made the French toast [see the recipe at the end of this post]. Can you tell me a little about them? LSQ: I’m of Italian extraction so, of course, my grandmother used to make them when I was growing up. A lot of people are just unfamiliar with it and what a great giving opportunity it presents for the whole family and what to do with it. COTS: How do people in Italy typically enjoy this…dessert? Is it even dessert? Is it snack bread? LSQ: Fortunately, in Italy life slows down a little bit. You have an afternoon tea or after dinner’s long over people are stopping by so there’s more leisurely opportunities [to enjoy panettone]. I think it’s tougher in our super-fast culture here to figure out how and when to eat it. But if you have it on hand obviously you can grab it and give it [as a gift]. Sometimes I like to give it with a bottle of prosecco, actually. It’s just a nice thing that can be pulled out. I’m always trying to strategize ways that I can simplify entertaining, particularly around the holidays. If I don’t have time to make dessert but I have the panettone I’ll put it out on a platter and with a bowl of tangelos or clementines and then just take a bunch of chocolate bars and break them up so you have a little bit of those different flavors. Then maybe I’ll serve tea or coffee after-dinner drink like Vin Santo or something like that. It also works on a breakfast or a brunch buffet. It’s very good as it is, but sometimes I’ll just cut it up and toast it and maybe put a little Nutella on the side or marmalade or something like that just to get it into more familiar shape for people who aren’t used to it. They eat it in many different ways in Italy. People are just so familiar with it, you know. COTS: You’ve definitely enticed me to pick up another one before the holidays are over. It’s a seasonal product, right? LSQ: Normally, you can get it between November and January. This past Thanksgiving I used it in stuffing. My dad is Italian and he always loves the sausage and the pork stuffing. So I cubed and dried some panettone and kind of combined the two. It was a really nice combination. It’s so much more versatile than people realize. LSQ: I’ll bet you could put panettone on a panini, I never thought about that. That’s another subject. If you like salty-sweet, I wouldn’t hesitate to slice up that panettone and put a slice of prosciutto and mozzarella and making a panini. That could be yummy. Break eggs into a wide, shallow bowl or pie plate; beat lightly with a fork. Stir in sugar, salt and milk. 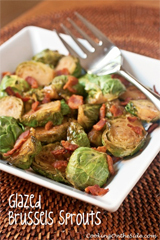 Over medium-low heat, heat griddle or skillet coated with a thin layer of butter or margarine. Place the Panettone slices, one a time, into the bowl or plate, letting slices soak up egg mixture for a few seconds, then carefully turn to coat the other side. Soak/coat only as many slices as you will be cooking at one time. 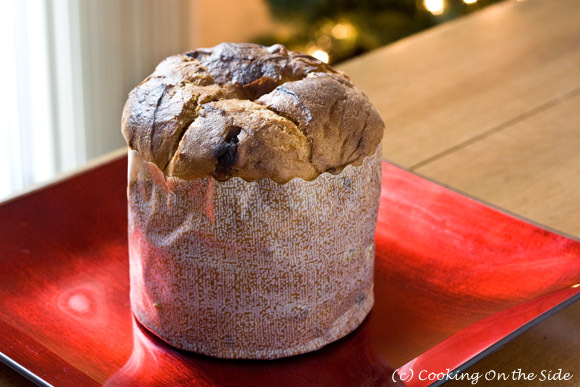 Transfer Panettone slices to griddle or skillet, heating slowly until bottom is golden brown. Turn and brown the othe side. Serve Panettone French toast hot with butter and syrup. You can also put ice cream on top and decorate with mint leaves. * You may want to adjust the amount of salt to suit your taste. For me, I prefer a little less. What a wonderful interview, I really enjoyed all of her tips and advice for the holidays. Great interview. Cool tips and hints and info! Very nice interview. Last year we made panettone bread pudding after the holidays. I’ve been eager to try the french toast.